Afford Anything’s Pay down your mortgage or invest in cash? I’m not even close to being able to think about getting rid of my mortgage, so it’s heartening to read about how they can fit into a solid investment strategy. I did, however, recently refinance my mortgage from a 30-year fixed rate to a 15-year fixed rate. I’m planning on this being the last refinance I will ever have to do on this house. When I moved into this house back in the summer of 2001, I was married and the mortgage was secured in both of our names. My ex-husband and I had very good money habits and stellar credit, but the mortgage rates in 2001 were not as low as they are now. We paid $100 extra on the mortgage each month, refinanced a few years later when the rates had dropped, and continued our practice of paying a bit extra to principal on a regular basis. Then we filed for divorce in 2008. I wanted to keep the house and my ex-husband was amenable to that, so I had to secure my own mortgage. My credit history and rating was fantastic, and I had a stable and well-paying job, so qualifying for a mortgage wasn’t going to be an issue. However, I wanted to do some work in the house and the divorce settlement was going to leave me cash poor, so I needed to secure a “cash-out” refinancing. I worked with a good mortgage broker, but the rates for a 30-year cash-out refinance weren’t as low as a standard 30-year mortgage and I ended up paying 5.5% interest when I closed in February 2009. In December 2009, I worked with the same mortgage broker to refinance to a new 30-year mortgage at 4.875%. At this point I had extra income from taking on roommates and had saved enough to create an emergency fund, so I felt it was time to start paying extra towards principal every month. Through December 2010, I used the old approach of adding an extra $100 to the monthly payment. (Actually, because I wanted to round-up my monthly payment to a whole number, my principal curtailment was the odd figure of $108.69 every month.) Then in January 2011, I decided to challenge myself more by rounding up the monthly mortgage payment even more, resulting in principal curtailment of just over $300 a month. Why such a big jump in my repayments? My age. I don’t want to be paying a mortgage in my retirement years, and since I’m in my mid-40s now, I needed to pay the mortgage down faster. I ran through some options in a mortgage repayment calculator and settled on the $300 figure to get the mortgage paid off by the time I was 67, my Social Security retirement age. It was also a stretch goal for my budget and I wanted to see how it worked out. What I found was that it wasn’t as much of a stretch as I thought it would be, and I was able to continue comfortably paying quite a bit extra while still saving money for vacations and a car. Mortgage rates continued to drop, and in October 2011, I decided to try refinancing yet again. I got in touch with my mortgage broker, completed all the paperwork, and paid my appraisal fee. This time I was going for a 20-year mortgage, so I could continue to meet my goal of paying off the mortgage by 67. Unfortunately while I had all the qualifications of a good lending prospect, the local real estate market was not in my favor. The appraisal on my house came back much lower than expected, and I was faced with the prospect of either paying PMI having to come up with a large chunk of cash so I could refinance without PMI. I decided to simply sit tight on my 4.875% mortgage and continue to pay extra in principal curtailment. It would not have been a good financial decision to take on PMI, nor to liquidate most of my cash savings just to secure a rate that was not quite a full percentage point lower than my current rate. Truthfully, I was devastated by the appraisal of my house. I know that home appraisals for purposes of refinancing don’t mean as much as a resale appraisal. It’s just a number of paper until you actually try to sell the house, after all. However for me, it did mean more. I had taken on the house as my main asset when I was divorced in early 2009, trading all of my cash on hand for it. So for me, the house was my divorce settlement in its entirety. Seeing that a bank appraiser thought that in November 2011 it was worth $85,000 less than in December 2008 meant that I had lost over $40,000 in the settlement. Even more crushing, the appraised value was $20,000 less than we had paid for the house in the summer of 2001. It was as if 10 years of diligent property improvements and extra principal payments meant less than nothing. I waited until the fall of 2012 before contacting the mortgage broker yet again about refinancing. In the meantime, I continued to pay extra on the mortgage, although in early 2012 my strategy of rounding up to the nearest thousand was coming out to only $275 extra. (The difference was due to more being added to escrow for taxes.) The mortgage broker wasn’t responding to my emails, though, and I didn’t push it. The real estate market in Chicago has been lagging other areas of the country, and I was in no hurry to be told yet again that my house wasn’t worth as much as I had paid for it. So when I got a call out of the blue just over a month ago from an employee of my current lender, Chase, asking if I wanted to meet to discuss a refinance I jumped at the opportunity. I set up an appointment at the local branch for the next week and brought along everything I would need to apply for a refinance, just in case. We ran some numbers for a 30-year mortgage. My goodness how low the payments looked. I told the bank rep how much I had been paying every month, including the extra principal payments. So we ran some numbers for a 15-year mortgage, and those payments looked very good, too. I told the Chase rep about my experience in the fall of 2011 with the appraisal on my house, and how I thought my diligent principal curtailment would have helped. Even if the appraisal came back the same, I had paid enough principal down that I would be back to the magic 20% equity mark. (Worst case: I would be close enough that a couple thousand dollars from savings would bring me there.) I was offered a 3.125% rate on a 15-year mortgage, so I thought it worth the appraisal fee and on we went. I know there could be rates lower than 3.125% out there for a 15-year mortgage, but I’m very happy with this rate. Chase also has a 1% cash back program if you have a checking account with them that is linked to the mortgage for automatic payments. With this program, 1% of the principal and interest payment is refunded after a year. The refunded amount can be applied directly to the mortgage principal or deposited in the Chase checking account. I did not have a Chase checking account at the time I applied for refinancing, but I opened one the same day I closed on my new mortgage. With interest rates on savings accounts being so low, I’m happy to get a little over $180 a year in the cash back program. The close of my new mortgage was completed in a matter of minutes. Really. I got to the branch at 9 AM and walked away from the desk at 9:10 AM with a shiny new mortgage. My first payment is due May 1, 2013, and my last will be due when I’m 60. I haven’t filed my 2012 income taxes yet, but I had planned to file them electronically like most people do these days. Unfortunately that option is no longer available to me because someone else has already filed a 2012 return using my social security number. A completely legit (and sizable!) 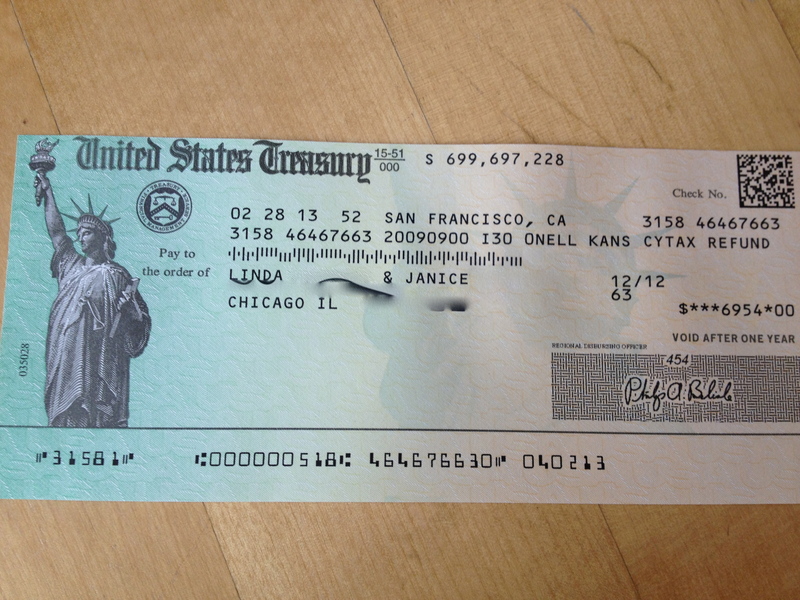 income tax refund check from the U.S. government. My first call Tuesday morning was to the accountant who is my tax preparer. He confirmed that my 2012 taxes hadn’t yet been filed and told me I would need to call the IRS directly. Calling the IRS around tax time is bound to result in a long hold time, so I was prepared for that. The phone tree I had to navigate was daunting and I accidentally hung up once, but I eventually got a real, live person on the phone. She asked me what tax year I had last filed, what my filing status had been, and whether I claimed any dependents. Then she confirmed the worst: that was definitely a refund check and someone had “used my information” to file a 2012 tax return. The IRS agent informed me that I will have to file my taxes the old-fashioned way this year: by mail. I must include a copy of a government issued ID and IRS Form 14039, an Identity Theft Affidavit (of course the IRS has a form for that!). My return will be processed manually, and if I’m entitled to a refund it may take up to six months for it to be issued to me by check. As for the check, I was instructed to write VOID on the back of it and to mail it to the processing center in Kansas City. I asked the agent if she could clarify for me that when she said someone had “used my information” to file a return that meant my social security number had been used. Her answer was yes, which meant that I had to take additional steps to make sure that my SSN isn’t used in even more damaging ways. I was instructed to contact one of the major credit agencies to place a free 90-day fraud alert, and that the agency I contacted would alert the others automatically. When I got off the phone with the IRS, I recalled that an insurance product I had purchased last year entitled me to identity theft coverage, so I placed a call to that company next. I was given similar information by the agent and also a bit of reassurance. She said that usually these types of thieves don’t tend to use the SSNs to open fraudulent credit accounts. I hope she’s right. One final step I took was to file a police report. According to the email sent to me by Equifax confirming the 90-day fraud alert, the report issued to me by Chicago Police Department should entitle me to an extended fraud alert, although I do have to mail in a copy of the police report and a form. I wish I knew how someone got my SSN, but it’s unlikely I’ll ever find that out. While I’m very careful with my personal information and always cross-cut shred anything that could be sensitive, there are still many legitimate reasons that I’ve had to provide my SSN, such as on mortgage applications and school records. Heck, when I was an undergrad we used or SSN as our ID! I had my SSN memorized after just one term since we had to provide it to enroll in classes and whenever we talked with an enrollment counselor or the financial aid office. I have no idea how those records have been maintained over the years; perhaps they were easily compromised. The IRS and financial institutions are aware of these scams and have been intensifying efforts to undercover this type of fraud. It’s because of the fraud screens the IRS and banks use that I received a paper check. The IRS agent I spoke with told me that the thief would have provided a bank account for an electronic refund, however something didn’t match up quite right and the bank rejected the deposit. This triggers the Treasury to issue a paper check, which then was mailed to the legitimate address used on the tax return. Thinking about this just as a taxpayer and not as a victim, it still makes me angry. The one link above points to an article on the IRS website that notes the identity theft screens “…helped the IRS in 2012 protect $20 billion of fraudulent refunds, including those related to identity theft, compared with $14 billion in 2011.” People rant about wasting federal dollars, but if this is how much is recovered, I wonder how much is actually not recovered and wasted on fraud like this? Those thieves are stealing our money! Money that could be better spent on social programs for the poor and sick, for example. Learning that your identity has been stolen is stressful and depressing. I think I’ve done all I can to protect myself from further harm in the short-term, and remain hopeful that this is the worst it gets.